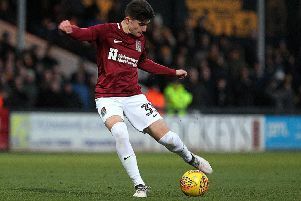 Midfielder Sam Foley believes the hard work that has been put in by the Cobblers players and management over the past few months is now paying off. Keith Curle has been in charge at the PTS Academy Stadium since the beginning of October, and has spoken constantly of changing mentality at the club and ‘putting the building blocks in place’ for a brighter future. It hasn’t been a smooth progression, and the team have suffered some serious bumps along the way, but last Saturday’s 2-0 win at Crewe Alexandra made it five matches unbeaten for Town. It saw the team move a hefty 15 points clear of a Sky Bet League Two relegation zone they have flirted with for much of the season, to within touching distance of the top half of the table, and to within nine points of the top seven and play-off places. On Saturday the Cobblers entertain Exeter City at the PTS Academy Stadium, knowing a win will move them to within seven points of the fifth-placed Grecians with 10 matches of the season remaining. Foley, who has returned to the team for the past two matches after missing six weeks with a back injury, is delighted with the recent upturn in fortune, and says it is down to hard graft. “All the hard work seems to be paying off at the minute and coming together,” said the former Port Vale man. “We spoke earlier in the season how we weren’t quite getting the rub of the green, and had been quite unlucky, but you make your own luck and it is starting to turn around. The boys have earned that. “If you look at the table it was kind of split in two, and we were top of that lower fraction, so for us to close the gap on those teams above us is what we are looking at, and to make the gap bigger below us.